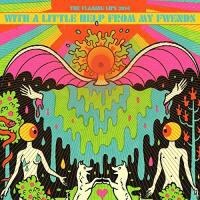 The Flaming Lips, with the help of more than a few friends, tackle an icon. Literally. With their latest stab at covering in its entirety a highly-regarded, classic album, the Flaming Lips seem to take a sort of perverse pleasure in breaking down the boundaries currently in place across a myriad genres within the popular music landscape, bringing together a number of dissimilar artists (chiefly among them and most immediately recognizable amidst the jumbled sonic chaos that has the feeling of a unified ensemble rather than individual guest stars, Disney Channel byproduct and headline grabber Miley Cyrus) and pitting them against some of the best known source material in 20th century popular music. This deconstruction of commercially sanctioned boundaries helps to remind listeners and performers alike that we’ve all sprung from the same basic wellspring and that there is no reason for the continued stylistic ghettoization that is contemporary popular music, setting as its backdrop one of the most influential albums of all time, one that arguably ushered in the modern era of popular music by taking a myriad styles and creating a cohesive, carnivalesque whole that continues to resonate to this day. And it’s within this concept of the carnivalesque the Lips seem to function most freely, if not at their best, turning a funhouse mirror on nearly everything in sight, bending and stretching, distorting and deconstructing to create something that, like the original, serves as a template for where music can potentially go when approached with a sort of reckless abandon. Opening track “Sgt. Peppers Lonely Hearts Club Band” holds to an initial aesthetic similar original, utilizing faux crowd noise and simulated orchestral warm ups to set the tone of an actual band preparing for an actual performance. From there, all bets are off as to how closely the Lips & Co. will adhere to the source material, playing with introductions to the point where, even those most ardent fans of the original album will become hard-pressed to recall the exact running order of the album, struggling to make out and correctly identify the next song before the telltale lyrics creep in to the mix. Here, rather than the organic instrumentation utilized on the original, they opt for a severely tripped-out reinterpretation with random blasts, synthy squiggles and digital bleeps (a common theme throughout). The vocals alternately speed up and slow down between the verse and chorus to create an extremely woozy, disorienting effect that continues, to varying nausea-inducing degrees, throughout the whole of the album, sounding as though two disparate versions have been spliced together, the recording sped up on the verses, slowed on the choruses, in a sort of mad deconstruction of the basic understanding of pop song craft. It’s a jarring effect that, when the outro descends into a searing J Mascis guitar solo (seemingly shoe-horned in for little reason other than to have Mascis, one of many guests here, on the album, albeit briefly), the listener feels somewhat pummeled by the experience. The title track is even more discordant, employing alternately warbling and wildly distorted vocals. Given the original album’s status within the pantheon of popular music, this type of treatment will surely cause a great deal of outrage amongst purists, but it’s ultimately an example of a group taking the piss out of the canonical treatment of rock’s past by filtering it, less than respectfully, through its current incarnation. It’s wildly disjointed, a fever-dream nightmare that, without foreknowledge of the source material, would be a complete and utter mess. “Lucy in the Sky With Diamonds”, with its fairly straight-forward reading from a noticeably huskier-voiced Cyrus, is about as true-to-the-original as the album gets, utilizing a similar stylistic approach and arrangement, albeit relying far more on electronic elements not available during the original’s recording. Until the chorus, that is. With its endlessly echoed “gone” as a gently misleading intro, the chorus’ massive sonic eruption proves somewhat euphoric in nature due to the shear volume with which it is present, a level sure to destroy a number of speakers and eardrums. This plays like a massive sonic wallop to the head that is then improbably soothed by the erstwhile pop-tart who gamely plays into the Lips’ psychedelic universe. Ultimately, “Lucy” proves to be one of, if not the most compelling destruction/reconstruction here and makes a clear case as to why this was toted as the lead single and example of the album’s byproduct. Not only does it feature a name even bigger than the Flaming Lips themselves (not to mention the subversive nature of the name attached to the finished product), it’s also the easiest and perhaps only real entry point afforded by With a Little Help From My Fwends. It’s also one of the only examples on the album of a track that feels fully realized. Elsewhere, songs are just that in the loosest estimation, sounding pasted together from myriad sessions and overflowing with innumerable ideas designed to significantly up the weird factor regardless of whether or not it is truly warranted, and bring together as many collaborators, all with varying degrees of availability, as possible. Filtered through innumerable effects processors, the introductory vocal harmonies of “Getting Better” are wildly disorienting before devolving into a near spoken-word, barely on key recitation of the verse from Chuck Inglish. It’s clear the Lips & Fwends are having a great deal of fun completely and totally desecrating this sacred text of rock and roll, reimagining it in their own drug-warped image. If not taken too seriously, it’s a wild, if wildly uneven, ride that will no doubt raise the hackles of many a die-hard Beatles fan. But those with open ears and a sense of the absurd will see the album for what it essentially is: a parody of the lionization of popular music, an arguably disposable artform in which we’ve, over time, imbued far too much significance and importance. Taken for what it is, a series of notes, rhythms and melodies capable of innumerable combinations, the album falls apart around itself, leaving the husk of familiarity that, like a half-remembered dream, never comes out quite right. Already a bit of a sonic anomaly on the original, George Harrison’s contribution (“Within You Without You”) here doesn’t sound all that strange or out of place, rather more a precursor of what was to come. It’s clear the Lips & Fwends hold a great deal of reverence for Harrison himself, lending the song a much more straightforward reading that the other tracks present, finding a like-minded approach to psychedelia across the decades’ long divide. It’s almost dull by contrast in its fairly tame, overly-reverential reading. Given the preceding tracks’ treatment, one would hope for a much more out-there approach to the original, especially given the heavily psychedelic-influenced talent collected here. Instead, the original’s sitar passages are rendered via squiggly synths and drones that fairly well replicate each line in a manner faithful to the original, albeit far less organically. It’s pleasant enough, but given the funhouse treatment afforded nearly everything else here, this original funhouse remains largely preserved rather than dismantled and reassembled using its existing, moldering components. “When I’m 64” finds itself completely and totally deconstructed, resembling its source material in lyric and melody alone. Floating freely in a sea of sonically damaged synths, burbling beats and assorted vocal manipulations, it’s like listening on a decomposing cassette, the sounds collapsing in on themselves (listened to in headphones, it makes the listener feel as though their head might be crumbling in on itself), varying in speed and tonality, skittering here, slogging there. It’s a fascinating deconstruction of a veritable pop standard that strays light years from the song’s music hall origins. With its massive 808 beats and atmospheric galactic video game skirmishes, “Lovely Rita” likewise falls far from its original (most notably in their refusal to rhyme “Rita” with “parking meter”, leaving in the “r” for emphasis). It’s a lovely, hypnogogic treatment of one of the more overlooked tracks on the original. Tegan and Sara’s little girl vocals underscored by Coyne’s raspy, breathy lines are a far cry from McCartney’s original vocal stab (thankfully), removing the often cloying nature of Macca’s takes and imbuing the track with something decidedly darker, yet nonetheless innocent. Ultimately it refuses to go anywhere as it saunters along, devolving into a series of distorted tangents. “Good Morning, Good Morning” is an industrial alarm clock from the brink of hell. One would be hard-pressed to imagine a worse way to wake up than to the sounds contained herein. Still possessing the original’s cartoonish tendencies, here they are ramped up and wrapped in a disorienting blanket of sonic carnage that pushes every element of the song as far into the red as possible; a blown-out nightmare than refuses to let up. Playing like pummeling industrial dance music, “Good Morning…” continues the Fwends’ steak of tearing down and rebuilding in their own fractured image. The “Reprise” plays it fairly straight, with the occasional bursts of tape noise and assorted randomness that would not have sounded too terribly out of place on any number of John Lennon’s later sonic explorations and digressions into the avant-garde, save the funky outro employed to move the song into the album’s elegiac closer. Hitting on a motorik groove of sorts, the band hits its stride and allows the track to go on far longer than the original, jamming on a repetitive figure while various bits come zooming in and out of the mix, the drums galloping ever onward, occasionally aided by a stray beat here and there, never wanting to truly leave off and cede control to “A Day in the Life”. Knowing what comes next makes this extended treatment all the more infuriating and exhilarating, after a time simply wanting them to get to the point and move onto the next track. With “A Day in the Life”, Coyne finally takes the lead himself, employing his best balladic, self-serious approach, one he used on the Lips’ more popular numbers from the early 2000s. His is a strangled rasp of a voice that perpetually seems on the verge of either sadness or sincerity. Of all the songs here, save Harrison’s contribution, this elegiac closer is given the most reverential, straight-forward treatment (although the bridge does descend into a weird hip-hop pastiche with Cyrus’ voice tape looped and warped, an off-hand comment that turns in on itself as she puts forth her huskier, sultrier voice atop sputtering beats). Eschewing the massive piano chord death that ends the original, here they employ an abrupt ending with Cyrus stating, “That’s not me, I don’t think." This seemingly tossed off statement (perhaps a phone went off in the studio?) speaks volumes to the impression this album will have on listeners. It will certainly be divisive: some camps seeing at as sacrilege, others praising its bold attempt at tearing down cultural icons. Ultimately it’s just pop music that has been filtered through the lens of popular culture, looking back on itself through contemporary eyes with the knowledge and hindsight that, at the end of the day, it’s just music and, like it or not, it can be profoundly influential but ultimately breaks down to a handful of notes that are recycled and reformed in a seemingly infinite number of possible combinations, some recognizable, others not so much. With this album, they show it’s okay to not take things like popular music and culture so damn seriously and just have fun with it or at it.